The driving force behind water movement in plants is evaporation through the leaves, which acts like a magnet pulling water up the plant’s plumbing system. However, because water is evaporating from a living surface, it is called transpiration. The problem is that plants want to hold onto their water and not let it all out through transpiration. Therefore plants are constantly struggling to hang on to their water. Recall the concepts of diffusion, osmosis and active transport as the main processes of substance exchange across membranes. Water potential is the property of water that determines which way it will flow, which depends on the concentration of solutes in the water and the pressure being exerted on the water. Another way to think about this is the water’s capacity to move or do work. Water potential measures the concentration of free water molecules. It is a measure of the tendency of these molecules to diffuse to another area. The more free water molecules, the higher the water potential. Water diffuses by osmosis from a region of high water potential to a region of low water potential through the water potential gradient. Osmosis can therefore be defined as the diffusion of water from a region of high water potential to a region of low water potential through a partially permeable membrane. Pressure potential is the amount of force being exerted on a solution. In living cells, this pressure comes from the contents of the cell pushing against the cell wall. The cell wall pushes back, causing turgor pressure. Turgor pressure causes plant parts to be firm and erect. ​When a plant cell loses turgor pressure, the solution the cell is in is hypertonic and the cell is plasmolyzed, which means water leaves the cell and the cell membrane shrinks. If water enters the cell at the same rate it leaves the cell, the cell is flaccid (and the solution is isotonic). When water enters the cell and pushes on the cell wall, the cell is turgid (and the solution is hypotonic). Water and minerals move into a plant through its roots. Near the tip of each branch of a root, there are thousands of tiny root hairs. These root hairs explore the soil to maximize the surface area within the soil profile. Water from the soil moves into these hairs byosmosis. The small size and large number of root hairs gives them an enormous surface area. So a lot of water can get into the plant very quickly. Plants need water. This basic fact is known to everyone, regardless of gardening experience. What some people do not know is that giving a plant too much water can do more damage than not giving it enough. Because plants do not have lungs to deliver oxygen to their cells, they must get it from the soil. Too much water in the soil layer forces air from the root zone, reducing the plant’s oxygen supply. This important oxygen is needed for the production of energy. ​Mineral ions are dissolved in the water. These include nitrate, phosphate, calcium and magnesium ions. These also enter the root hairs. They travel into the plant dissolved in the water. cannot be absorbed by osmosis because this is the movement of water only. They cannot be absorbed by diffusion, because the minerals are in very low concentration. Instead, active transport is used. The root hair cells have carrier molecules on their cell membranes. These pick up the mineral ions and move them across the membrane into the cell against the concentration gradient. 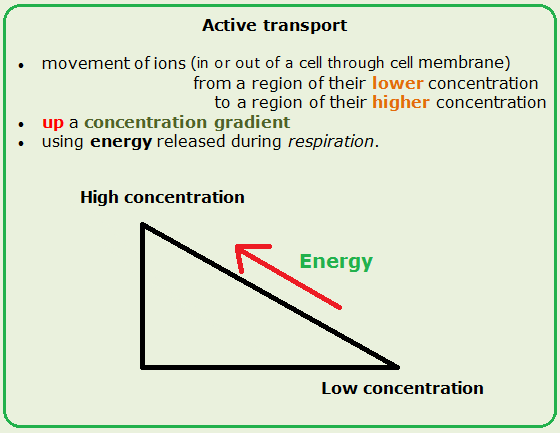 Remember that substances move down a concentration gradient in diffusion, so active transport is quite different. Active transport needs energy from respiration to happen. Describe how water and minerals move upward through the xylem and how water balance keeps plants upright. The xylem tissue transports water and minerals. It consists of interconnected vessels and tracheids organized into continuous conducting tubes stretching from the roots to the leaves. These tubes carry water and minerals to all parts of the plant. 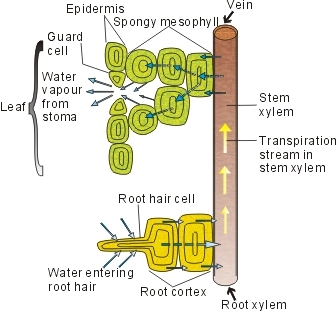 Evaporation from the mesophyll cells produces a negative water potential gradient that causes water and minerals to move upwards from the roots through the xylem. Explain the process of transpiration and identify the transpiration streams as a means of water transport in vascular plants. ​Plants lose gallons of water every day through the process of transpiration, the evaporation of water from plants through pores in their leaves. Up to 99% of the water absorbed by roots is lost via transpiration through plant leaves. This water loss allows the plant to access CO2 for photosynthesis and to cool itself. Transpiration explains how water moves up the plant against gravity in tubes made of dead xylem cells without the use of a pump. Water on the surface of spongy and palisade cells (inside the leaf) evaporates and then diffuses out of the leaf. This is called transpiration. 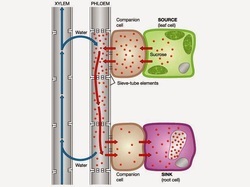 More water is drawn out of the xylem cells inside the leaf to replace what's lost. As the xylem cells make a continuous tube from the leaf, down the stem to the roots, this acts like a drinking straw, producing a flow of water and dissolved minerals from roots to leaves. When water is scarce, or the roots are damaged, it increases a plant’s chance of survival if the transpiration rate can be slowed down. Plants can do this themselves by wilting, or it can be done artificially, like removing some of the leaves from cuttings before they have chance to grow new roots. Recall that the stomata contols the movement of gasses into and out of the leaf. Describe the factors that regulate the rate of transpiration. Temperature:Transpiration rates go up as the temperature goes up, especially during the growing season, when the air is warmer due to stronger sunlight and warmer air masses. Higher temperatures cause the plant cells which control the openings (stoma) where water is released to the atmosphere to open, whereas colder temperatures cause the openings to close. Relative humidity: As the relative humidity of the air surrounding the plant rises the transpiration rate falls. It is easier for water to evaporate into dryer air than into more saturated air. Wind and air movement: Increased movement of the air around a plant will result in a higher transpiration rate. This is somewhat related to the relative humidity of the air, in that as water transpires from a leaf, the water saturates the air surrounding the leaf. If there is no wind, the air around the leaf may not move very much, raising the humidity of the air around the leaf. Wind will move the air around, with the result that the more saturated air close to the leaf is replaced by drier air. Soil-moisture availability: When moisture is lacking, plants can begin to senesce (premature ageing, which can result in leaf loss) and transpire less water. Type of plant: Plants transpire water at different rates. Some plants which grow in arid regions, such as cacti and succulents, conserve precious water by transpiring less water than other plants. Check out these video clips on Transpiration. Review Active Transport with the animation on pg 132 of your Active Book.